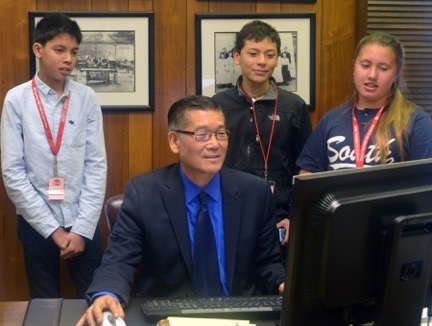 Superintendent Michael Matsuda (center) with students. Respected educational leaders like Michael Fullan, Linda Darling-Hammond and David Conley have repeatedly warned us that we should not make one big test the main driver of education reform. Sadly, it seems that with the new Smarter Balanced Assessments that students throughout the state are taking now, many school districts are doing just that. Across California, there is a danger that too many districts are focused on technology just to get students prepared for the Smarter Balanced test and not investing in integrating pedagogy with technology. For example, it would be a horrible misuse of public funds if students were using iPads just to take notes. Fullan warns of a missed opportunity if we are not investing in training teachers to use technology so that students can access more meaningful information and create better ways to problem-solve. English learner advocates such as Shelly Spiegel-Coleman are concerned that since the Smarter Balanced assessments do not measure speaking skills, oral communication will not be emphasized and long-term English learners will continue to languish behind mainstream students. The question for us, therefore, is not how prepared are California’s public schools for the Smarter Balanced Assessments, but how prepared are our 6 million K-12 students for college, career and civic life as the next generation of Americans? Many educators who truly want to teach beyond the test are struggling with what college and career readiness really means. Fortunately, there is at least one organization that has developed a framework to help build capacity and understanding. The organization is the Partnership for 21st Century Learning, a consortium of educational organizations, businesses and educational nonprofits that have developed a host of tools and rubrics that are helping to move the needle forward using easily understandable terms. For example, the “4 Cs” – collaboration, creativity, communication and critical thinking – is a term credited to P21 and is language that is accessible and widely used. Moreover, the framework calls for access to a whole curriculum, including what we in California call the A-G requirements. It is vital to note that access to a whole curriculum should begin in preschool and should be provided during the school day. When schools had to comply with the demands of the No Child Left Behind law as well as the accountability provisions triggered by the state’s Academic Performance Index, civic education, science, world languages, the arts and career technical education were often pushed to after-school activities or weren’t taught at all. Millions of elementary and secondary school children, mostly low-income students and English learners, were given high dosages of reading and math test prep and tragically missed out on the other subjects. This is what happens when the test becomes the driver. But when college and career readiness becomes the driver, great things can happen. Savanna High School in Anaheim is California’s first National P21 Exemplar School, so named because the learning environment and school culture reflect the fact that 21st century learning is taking place and contributing to student success. It is an urban public school that State Superintendent of Public Instruction Tom Torlakson said “should be cloned.” Why? Because it has implemented reform without changing the teaching staff, without extra monies and without cherry-picking high-performing students. What the staff did do was closely examine the P21 Framework, David Conley’s work on college readiness, and their own research to create a new vision, which has guided and transformed their school. Savanna students are doing well on measurable metrics including A-G readiness, graduation rates, Career Technical Education certificates, Seal of Biliteracy rates, writing and performance tasks, and student surveys. But more importantly, Savanna students exhibit hard-to-measure metrics such as habits of mind, which are problem-solving, life-related skills necessary to operate effectively in society and navigate difficult and complex situations. These skills are evident through senior capstone interviews, where students sit down for 20 minutes with teachers and community members and reflect both orally and in writing on the relevance of their education and their future plans. I’ve personally interviewed students who may have many Cs on their transcripts, and who may have only average SATs, but who have demonstrated college and career readiness by overcoming difficult circumstances, often poverty-related, and who can articulate their goals well and have identified a realistic pathway for getting there. What is happening at Savanna can happen everywhere if leaders have the courage to do what’s right. It will take bold, innovative principals who can build teams of teacher leaders through collective capital – working together using combined skills and resources. And it will take superintendents and boards who develop 21st century visions that drive school reform. Otherwise, it could be business as usual. Michael Matsuda is superintendent of the Anaheim Union High School District. Please give us examples of career. I’m curious what is being offered students as help in the area of selecting career pathways. The high school where I’ve been teaching for 20 years has had career academies with internships for a long time yet we still have many kids not involved in those or feeling left out if their interests, skills, talents are not reflected in one of our 4 options. The academies definitely provide smaller learning communities as well as internships but neglect to genuinely help students see their futures as complex puzzles they must put together to create the full quality of their lives. As a mother/teacher I feel that schools are not doing enough to give students a guided journey into self-discovery and knowledge needed to make the monumental decisions they will make about their future. Freshmen in high school begin failing classes, for example, before they even know the consequences. I’m stunned daily when I learn how little they know on the serious topics connected to what it takes to become and independent, successful, happy adult. Many decide the do or do not want to go to college with very little and often incorrect information. 12 years ago I created to help address those issues. I started mostly to help me usher my 3 children into adulthood as I realized they were each different, with different needs, talents, interests and skills. Freshmen who take my class fail at lower rates than those who do not. In my class they are given guided opportunities to learn the vocabulary of academia, the workplace and all areas of college options, finances, value of education as a whole, cost of living, over coming obstacles, self-motivation, career options including income levels, projected job markets and more. They report that they love the class because it is REAL life. Since there was no textbook for me to use, I ended gathering all my lesson plans over a decade of evolution into a workbook called Get Real! Parents love the class equally because it gives them ways to discuss these vital topics so I created a parent companion book so they can be more closely engaged in the learning. I’d love to find other teachers (because I am sure they are out there) who have developed ways to improve the success of students in these critical areas of thinking that go far beyond the testing and limited scope the academies offer today’s students. Kudos to the students and staff at Savanna, and to your leadership Superintendent Matsuda. As you point out, college and career readiness needs to start long before high school. We’ve found that working with middle school youth on non-academic aspects of preparedness can have significant impacts on their high school and postsecondary careers. And the effect ‘spills over’ into their academic achievements. For more insight into the research that supports this approach, go to http://issuu.com/cccadmin .